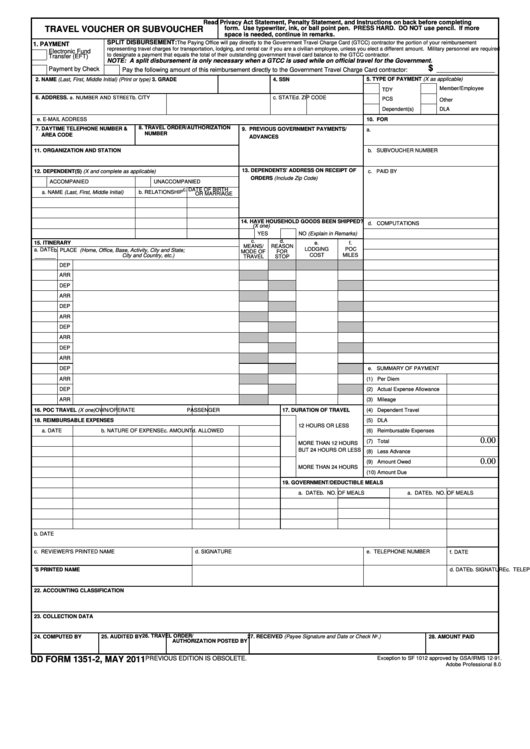 Download a blank fillable Dd Form 1351-2 Travel Voucher Or Subvoucher in PDF format just by clicking the "DOWNLOAD PDF" button. Complete Dd Form 1351-2 Travel Voucher Or Subvoucher with your personal data - all interactive fields are highlighted in places where you should type, access drop-down lists or select multiple-choice options. space is needed, continue in remarks. to designate a payment that equals the total of their outstanding government travel card balance to the GTCC contractor. NOTE: A split disbursement is only necessary when a GTCC is used while on official travel for the Government. 14. HAVE HOUSEHOLD GOODS BEEN SHIPPED? Exception to SF 1012 approved by GSA/IRMS 12-91.